It's two bracelets in two years for The Grinder. 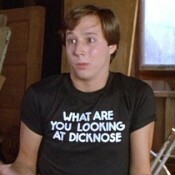 The former “best without a bracelet” has defeated someone who may now rank…dare we say… among the new “best” without. 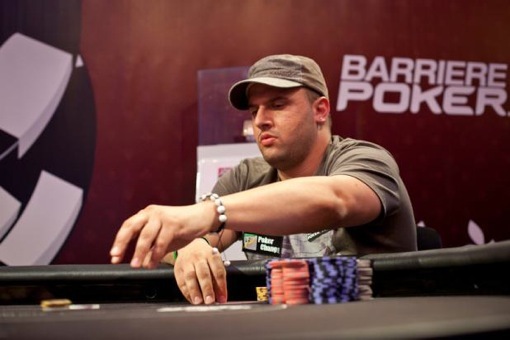 Michael “The Grinder” Mizrachi outlasted a stacked field to capture 2011 WSOP Europe Event #5 ( €10,400 NLH Split Format). The win gives Mizrachi his second bracelet and adds €336,008 to his career tournament earnings (now totaling around $11.7M). Mizrachi defeated Shawn Buchanan (€207,624) heads-up for the title. Buchanan just misses his first bracelet yet again, as this makes his third 2nd place finish in a WSOP event. Get full event results here. 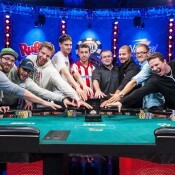 Follow the WSOP-E Main Event, which is currently underway, here. 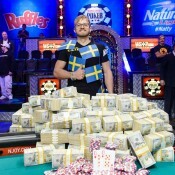 2012 WSOP Poll: Should Main Event Banners Be Removed?